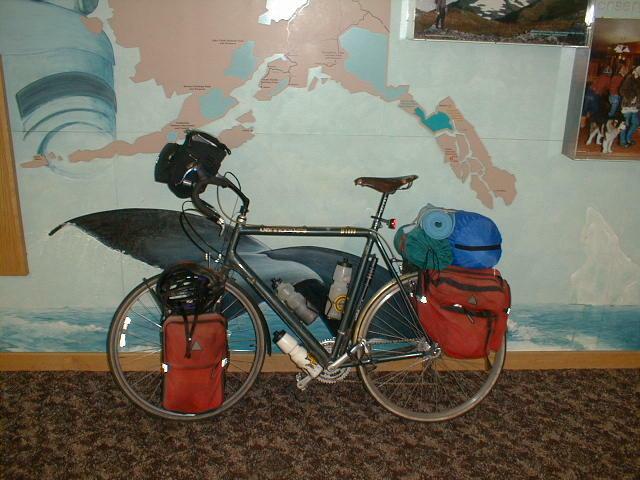 This web page describes a bicycle tour I took from Haines, AK to Skagway, AK in summer of 2000. 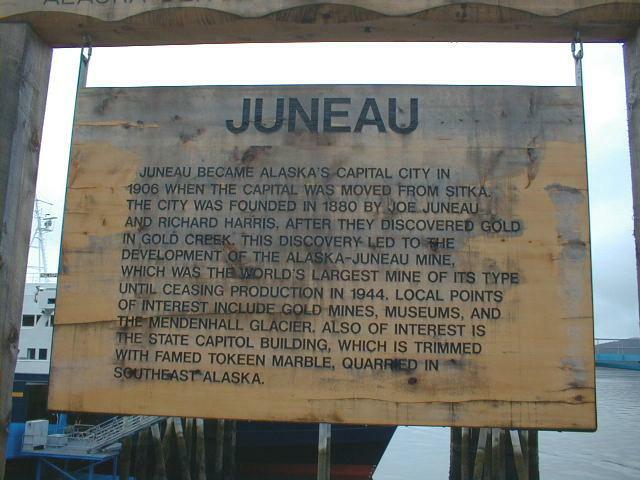 The route crosses the coastal ranges of Alaska inland into the Yukon, tracing some of the routes taken by those in the Klondike Gold rush of 1898. 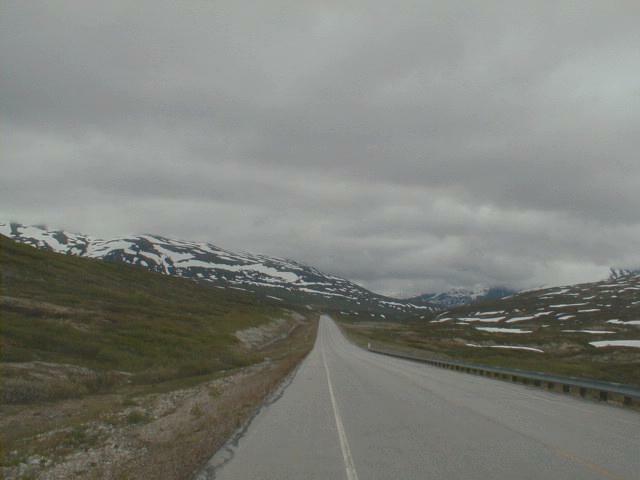 Tourist guides also call this route the Golden Circle. Click on any picture to see full-size view. Departed directly from work with loaded touring bicycle. I had perhaps 35 pounds of gear, not too bad in flat San Jose, but I'm sure to notice climbing the hills ahead. First tour in three years where a tent would be necessary. Strangely comfortable to have the loaded truck handling of my touring bike. Flight from San Jose was uneventful. By my count, this is the 28th time I've disassembled this bike for flying. Now if they'd only have frequent flyer miles for bicycles; seems only fair given the customary $50 fee for taking a bike. Flight from Seattle to Juneau was delayed by two hours. This meant it was 3 am Alaska time when I got into Juneau Airport. The airport is about eight miles north of the city center. Cycling further north an additional five miles brought me to the ferry terminal at 4:15am. Temperatures of 50 degrees and damp made it feel quite cool. The Malaspina is a very large ferry that makes the round trip from Juneau to Skagway daily during the summer. Comfortable lounge chairs to get a little more sleep. 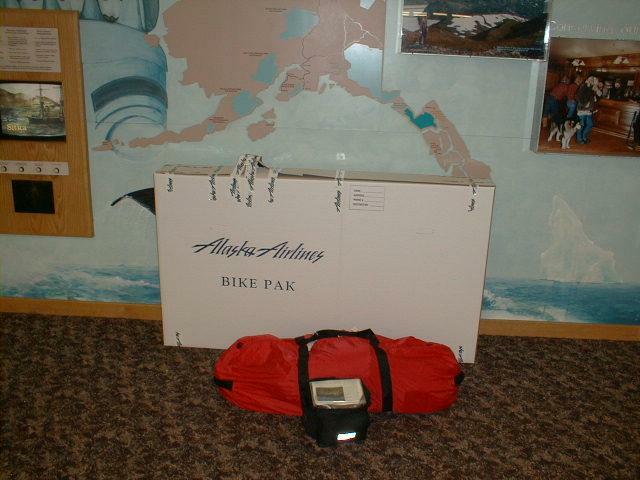 $24 for me and $10 more for the bike and I'm on an Alaskan cruise! There was an interesting talk about Humpback whales. We saw about a dozen killer whales, half dozen humpbacks and half a dozen porpoises. Also, several eagles in the trees. The shore had steep tree covered hillsides, snow covered mountains above. Arrived 12:30 at ferry dock and fairly quickly cycled the four miles to a motel. 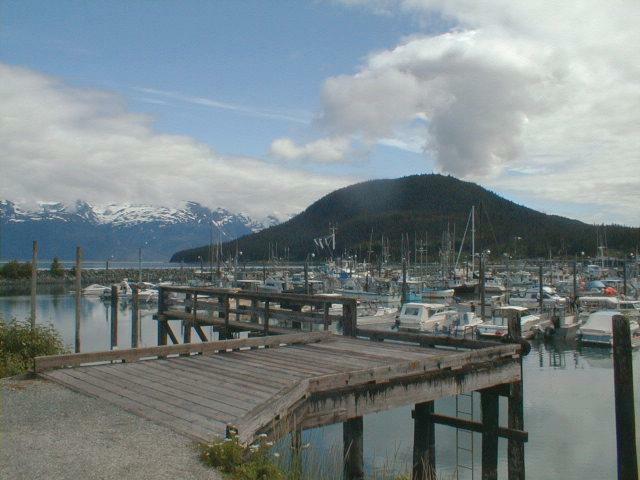 Haines is a sleepy little town. 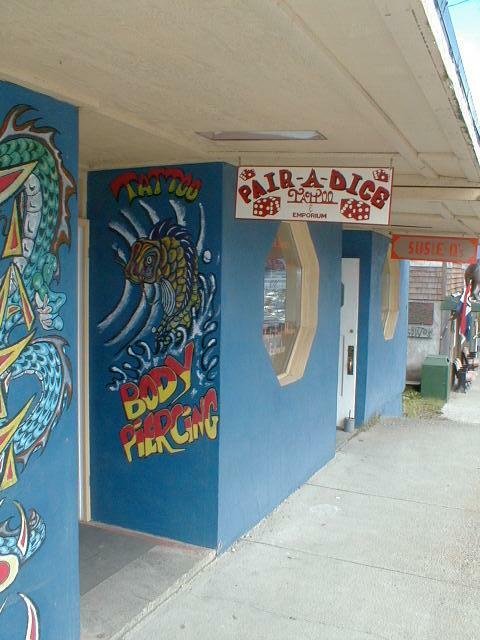 Main street with a few short blocks of stores: souvenirs, groceries, tattoo parlor and a restaurant or two. Nice two story museum. 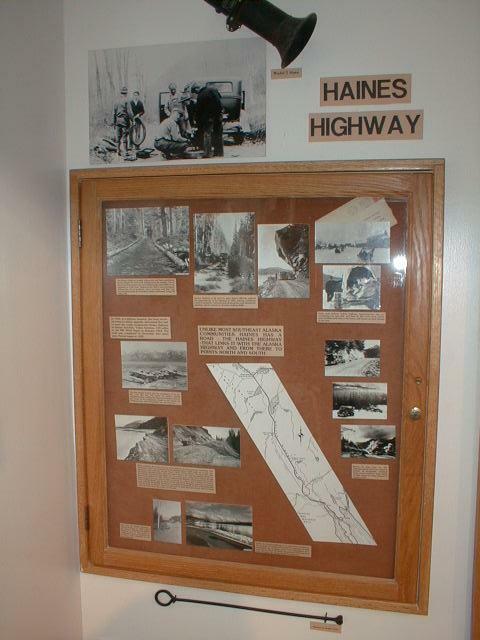 Looks like history of Haines reflects lot of history of Alaska...fish, timber, gold, Tlingit Indians, road building and tourism. 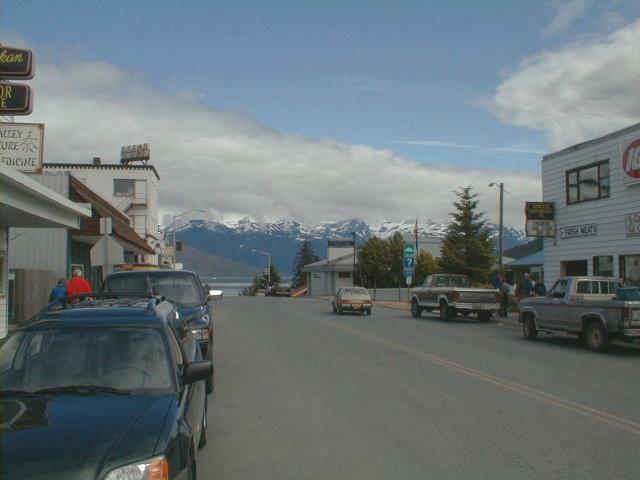 Haines is situated on a peninsula at base of broad glacier carved streams. 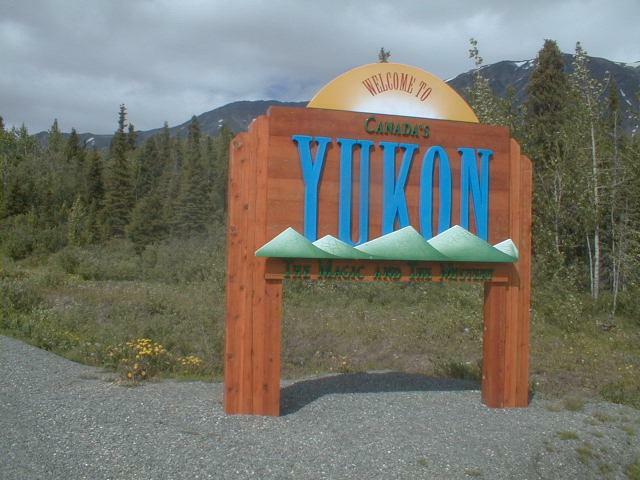 A natural gateway city to interior of Alaska/Yukon. I saw several eagles flying around the harbor. Apparently, they are as common as chickens here. Left 4:30am Alaska time. 18 hours between sunrise and sunset so not clear if it ever gets very dark. First 20 miles were extremely flat as the well-paved road followed the river. After that an occasional slight rise in stretch leading to 33 mile roadhouse. Low clouds but fortunately dry. This route crosses the bald eagle preserve, where some 4000 eagles may be found. Peak times are late fall when the salmon spawn and this stretch of river is one of few kept ice-free. Nice high mountains on each side, still covered with snowfields. Pass Mosquito lake and reach 33 mile roadhouse 7:30am, half hour before it opened. Nice breakfast of an omelet and hot tea. Last chance for 100 miles. Just past the 33 Mile Roadhouse, the route got worse. No shoulder, beat up road deck and a mile of gravel at milepost 37. The road climbed up and over a low hill before reaching the border at milepost 40.7 (km 71.3 though the miles & kms are not always consistent in the Milepost). The border guard quizzed me very carefully. Alcohol? No. Cigarettes? No. Destination? Skagway. How long? A week. How much money? Apparently enough. Food? Yes. Weapons? No. Guns? No. Pepper spray? No. Even for the bears? She warned me about the grizzly sightings. Questions about the bears had me a little confused. From what I'd read even pepper spray was a weapon and could not be carried into Canada. Didn't ask but wonder if they would make exceptions for this type of area (though, I'm also sure I don't want to get close enough to a bear to find out how well pepper spray works either). Just past the customs station began an 18km climb to almost 1000 meters. It was a slow slog uphill made a bit worse by the fact that I didn't know it was 18km long. The road slowly climbed up the side of the valley with a few short descents that lost a bit of the precious elevation. Near the top of the climb I cleared treeline and the route flattened out a bit. At km 86 I saw a bear. Grizzly, I believe. He saw me too as he was ambling along. Raised up on his hind legs and decided this contraption was a bit odd. Turned around and ran the other direction. I could tell I was crossing some dramatic mountains even with their summits covered in clouds. From Three Guardsman Lake there was a short descent before the final climb to 1070 meters and Chilkoot Pass. Hooray! The summit was at km 102 and for the next 30kms there were intermittent descents that paid me back for the climb. Also a light tailwind. What more could a cyclist want! Unfortunately, my celebration was short lived as the infamous "road construction" turned into 16kms of gravel at km 144. There was a surprising amount of traffic with each of the cars raising a dust cloud as they passed. The road also tilted up with a steep climb. It was steep enough, particularly at the end of a long day that I walked some of the route. Unfortunately the uphill riding/walking was slow enough that the mosquitos were stopping in for a bite. The gravel climb was fortunately a few kms long. It took a bit of care, but I could descend fairly well, and even keep ahead of mosquitos. The campground sign was welcome at the bottom of the hill (though it did mean a climb first thing in the morning). Mosquitos are out so the tent was quickly set up. Dinner was no-cook, peanut butter and crackers. Campsite cost $5.50. Something got into my food pannier at the campground, perhaps a bear or...? Zipper was broken, interesting claw marks on an apple and the pannier strewn open with jar of peanut butter on the ground. Fortunately nothing else, and I'd been careful to avoid food in the tent and park the bike 25ft away. My panniers weren't too tightly packed so was able to shift stuff around to keep everything from falling out. It gets light early (and never fully dark) in the summer, so once I decided to get up, the mosquitos ensured I kept moving and was on the road early. Pavement! Nice to have after yesterday's gravel. 3 kms of climb followed by almost 10kms of descent. It was wonderful to see the landscape unfold, as I passed around and through several mountain ranges. From here into Haines Junction, trees along the way. Generally rolling terrain with and what felt like more descents than climbs. Sun came out early, though later in the morning it started to rain just enough to get the pavement wet. After the Klukshu river, saw a few houses as the route went around Dezadeash Lake. From here into Haines Junction, the route became flatter with mostly forest along the way. 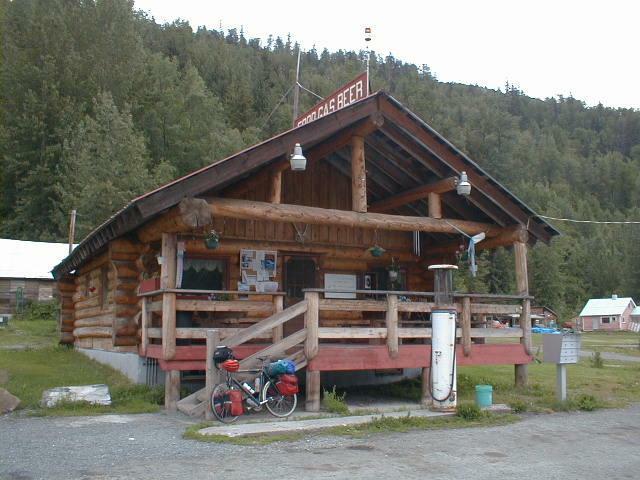 I was able to make some good time and stopped in at Kathleen Lake lodge for breakfast, at mile 40. First gas and cafe since 33 mile roadhouse. After Kathleen Lake light rain and gentle hills through forest to Haines Junction. Last few kms a fun descent into town at mile 56. Though it was only 11:30am, decided to get a motel (no motels between here and Whitehorse). The clerk was pleased as I took the last room and she could put out the "No Vacancy" sign. Got safety pins for the pannier and wandered around town. Skies cleared up and the sun came out again. 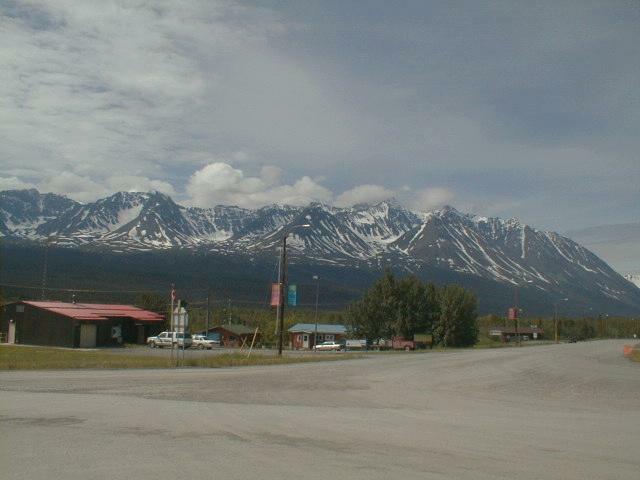 Haines Junction has a nice visitor center for the Kluane National Park. Largest, non-polar ice fields in the world. Otherwise half a dozen motels, some restaurants and other road businesses. The phone book listings fit on three pages. 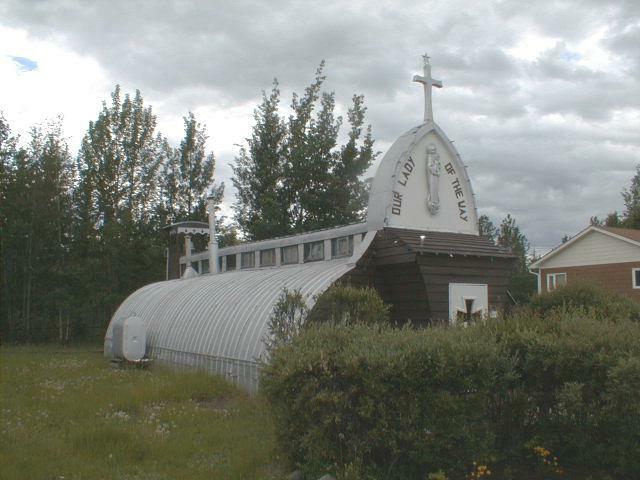 In town there is a curling rink, a library and a catholic church in a quonset hut. The town monument looks like a giant cupcake with animals on top. 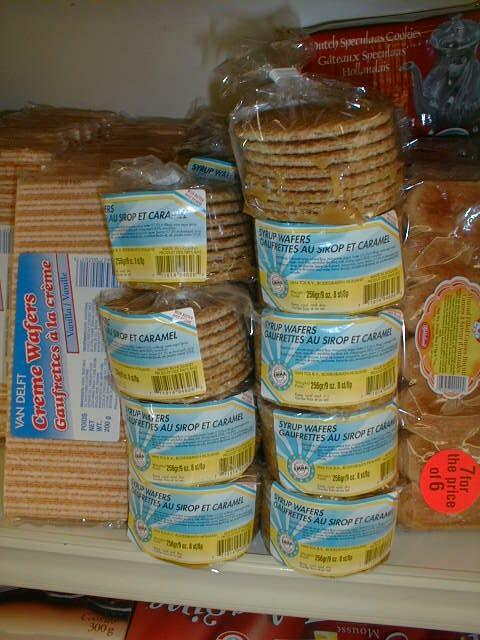 One market, but this one had "syrup wafers", something not normally found around San Jose. Noticed that all food packages are labeled in English and French. Power was out when I left Haines Junction at 5am. Passed the crew working at the substation, an advantage to these small towns where all is on one street. 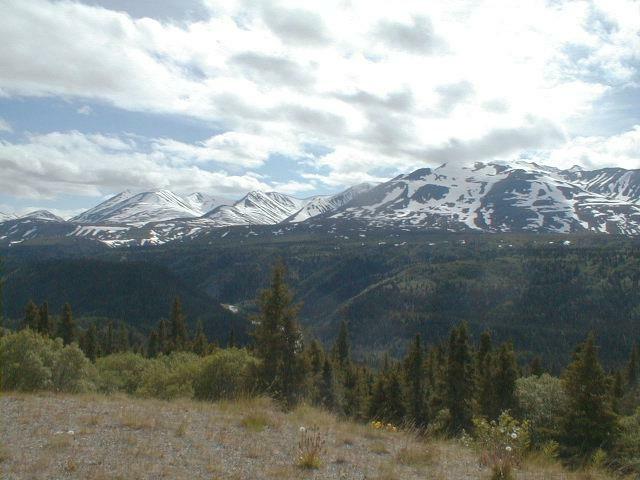 The entire route from Haines Junction to Whitehorse was relatively flat, with either long gentle grades or occasional steep sharp hills. Sometimes it was tough to tell the long slight upgrades, except by noticing things going slower and then looking back. First stretch from Haines Junction was through forest with ~150 yards wide cleared of trees. Areas along the road had bright flowers, purple, reddish and others. I was heading away from the highest peaks but could still see shorter hills ahead. Road was 'old' without much shoulder, but smooth. Stopped at 20 miles at Otter Falls to replenish water. They really do say "eh!" 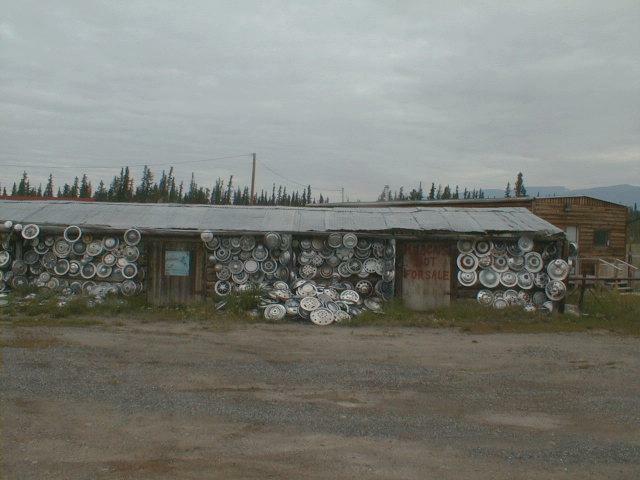 up in the Yukon. Seems like 40% of the traffic on the road was some form of RV or 5th wheeler. Some of these were enormous, towing a full 4wd car behind. I think my mileage of 60 miles/gallon (of water) is perhaps an order of magnitude more efficient. I saw two bears. The first was a black bear beside the road at km 1594. When I went past, the bear decided to rush off into the woods. The second brown-colored bear was 20kms later. He crossed over from the left side of the road. He didn't see me at first, so I stopped, made some noise and slowly went past. Champagne (km 1568) was my next stop. 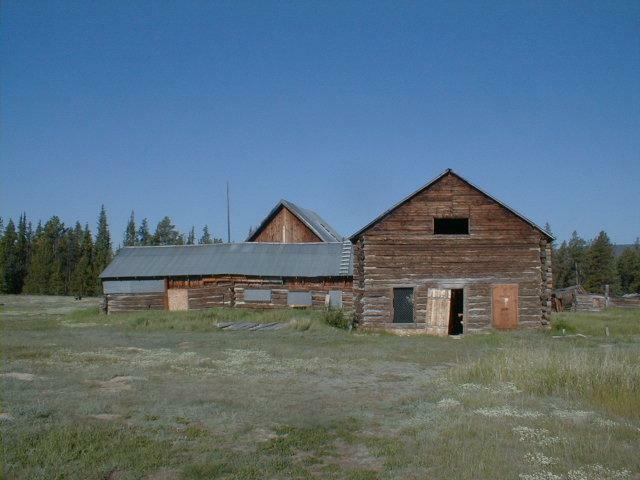 This former roadhouse and trading post was not a site for the Champagne-Aishihik Indian Band. Here I became a tourist attraction myself. Just before I got there a tour bus from Minnesota had stopped. As they were herding the tourists back on the bus, Donna asked me to speak briefly to them (she called it "local color", but I'm sure they were wondering what would possess someone to cycle through this wilderness). So I took the microphone and stood in the bus to talk a little about my vacation, bears and all. From Champagne, I climbed past the radio tower and into the Takhini River drainage, thus crossing from Pacific Ocean drainage to Yukon River. Like other climbs today, it was very subtle. After Champagne, the road included about 25kms of rough chip seal. Wider shoulders than the first half, but very rough to cycle. 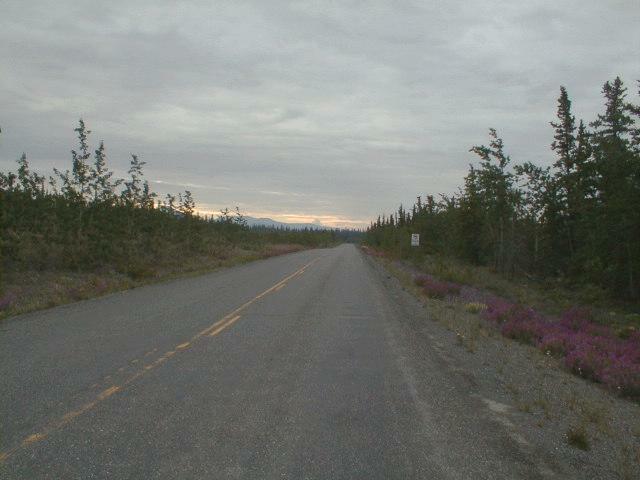 Once I got within 50kms of Whitehorse, the road improved considerably. The Takhini was site of huge forest fires in 1958 (2500 sq miles). Aspen have come back, but otherwise it will take a long time to regrow. Tahk means mosquito and heena means river. There were quite a few out today, so I kept moving. By noon, I had 80 miles done, and started to slow down. Perhaps the short collection of hills, or perhaps no meal yet today, but I was going a bit slower. I still made it to a motel by 2pm, which isn't too bad for 100 mile day. Signs for Whitehorse started 30km from town. Some such as "cuban cigars, fish flys" weren't as interesting, but nice to see other services. Apparently, 23000 of the Yukon's 31000 residents live in Whitehorse. 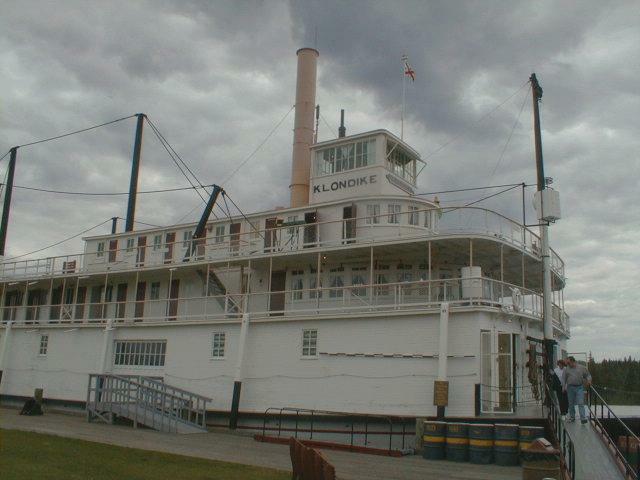 Wandered around town, saw the S.S. Klondike, a paddle boat that went on the Yukon River until 1955. 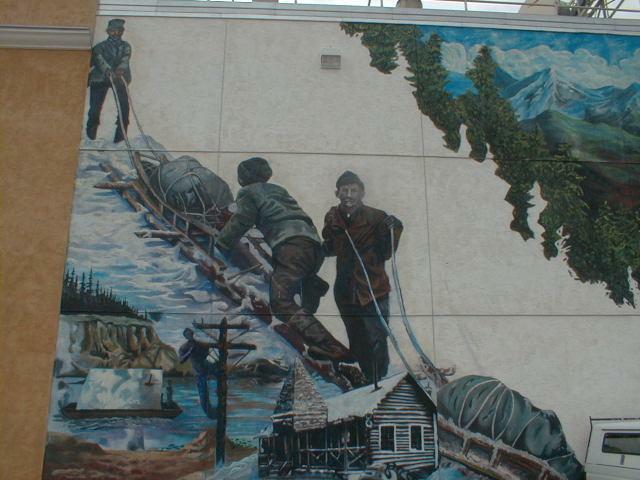 The highway to Dawson City came in 1952, prior to that, boats were used. Only 4 months per year free of ice. Nice visitor center, shops and interesting wall murals. One tourist trap is a three story log cabin. A book talk at the Whitehorse Library. John Harris and Vivien Lougheed wrote a mixed guide book and history about the Tungsten, NWT area. Nice slides about an 18 day wilderness backpack trip in the Nahani region from Tungsten. Left Whitehorse at 6am, little later than normal, but also potentially a shorter day. First 17kms followed the Yukon River upstream. Even here a large waterway, must be even larger below. Initial 17km with smooth shoulders, though still several short hills. Breakfast at the road junction. There seems to be a high proportion of country music playing in these places. The first 10kms of the road south had some bumpy chip-seal. Things turned out better than expected as this was the anomaly and not the rule. Mostly forest, though I could start to see the mountains I was approaching. Some gentle climbs and then surprisingly long descents. Stopped at several sights along the way. 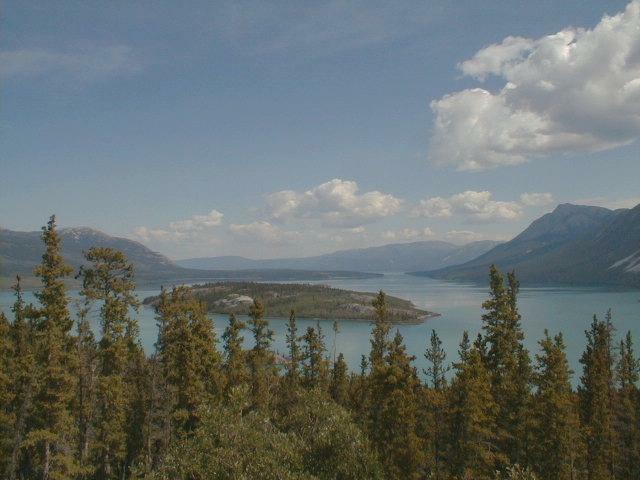 Robinson Roadhouse, an abandoned townsite along the railroad; Emerald Lake, beautiful blue-green and Carcross Desert, very sandy. 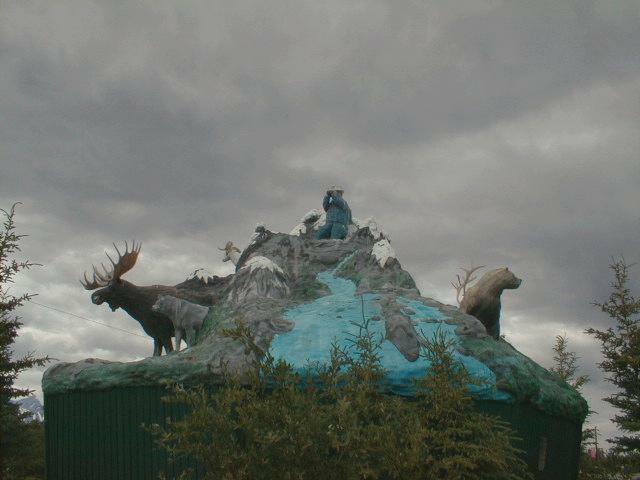 I also passed a few up: Frontierland (largest stuffed polar bear) and the Cinnamon Cache ("get your buns in here"). 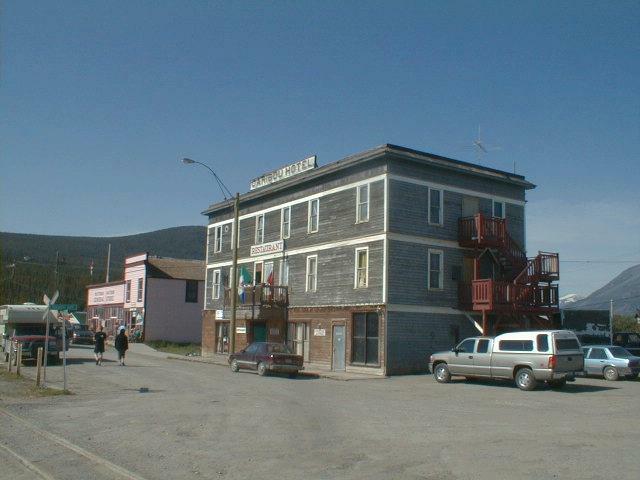 I was in Carcross before 11am. The visitor center in town is nice, but the restaurant looked dirty/smoky. So back to the main road and lunch at Montana's. Spent about an hour and a half in Carcross. Finally at km65 I figured I was tired enough for the day so called it quits and pitched my tent at Tutshi Lake. 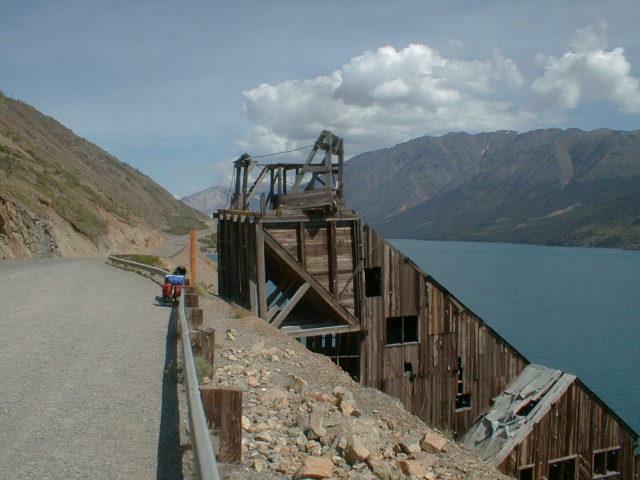 This route did pass several interesting mine and mill sites. None operational anymore. However, there were some "danger arsenic" signs, so I was careful where got my water. Overnight I could hear the wind in the trees and the waves on the shore. It rained just enough for me to put the rainfly on. Up at 4:30am in foolish hope of getting up before the wind. The first 10kms were along the lake, several climbs and descents and a consistent headwind. Skies were overcast and menacing. End of the lake was @ 58km and surprising calm. No wind at all as I climbed away from the lake. Saw a lynx at km 56, just sitting on the road. A large moose with calf crossing the road 6 km later. The road continued to climb through the forest. Stopped briefly at Log Cabin where the narrow gauge crosses the highway. The only log cabin left now is the restroom at the trailhead. 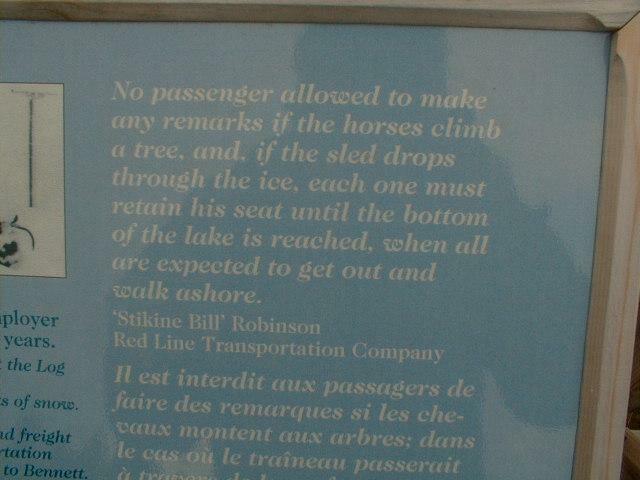 Interesting signs about the Chilkoot trail, a primary route for miners in the 1898 gold rush. 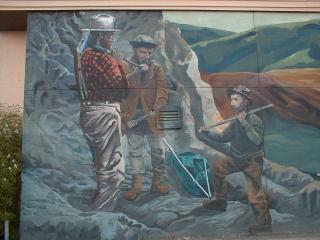 The RCMP would enforce 6-12 months of supplies per miner or roughly a ton of goods. Quite a bit to carry over the pass. Nearing Frasier (km 36), the wind came back with a cold fury. I started to climb into the clouds. Waved to the Canadian customs and set off the last cold 12kms to the summit. This stretch completely in the fog so didn't see much of scenery. Mostly above treeline. Passed a few alpine lakes, but couldn't see much more with 25ft visibility. Wool hat and mittens still on, I was keeping myself warm climbing up the hill. 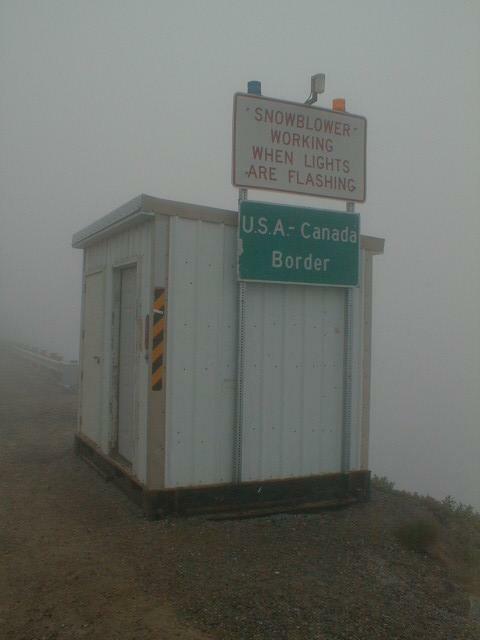 Surprised to see the border, followed 500m later with the top of White Pass. Descent! 3000ft in 11 miles. Almost too steep, but nice to descend into Skagway. US customs at mile 6 where got my passport stamped. No tough questions this time. 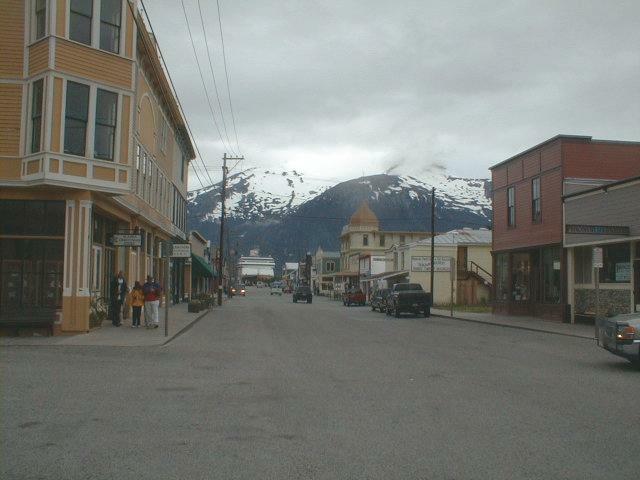 Skagway is a strange little town, very much oriented to the cruise ship trade. 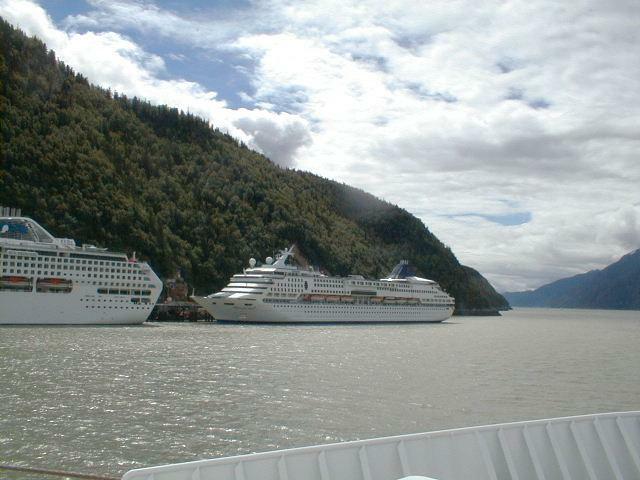 7000 passengers arrive today from six different boats. For the summer season, they expect 400,000 cruise ship tourists. Another ~200,000 tourists will arrive on the highway. Looking at the boat schedule, seems like Wednesday and Thursday are particularly busy. Only 3 days this summer without any boats. Catering to the tourists is a small National Park office and seven blocks of overdone souvenir shops. 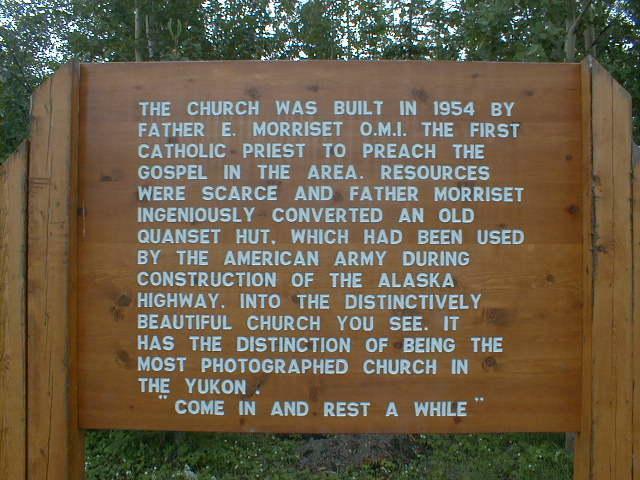 Many of them set up in 1898 motif. 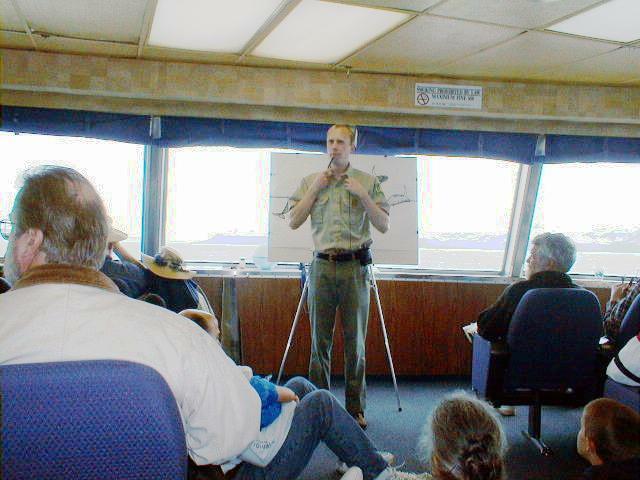 Various shows, presentations also set up for the boats. However, if one cycles just a few blocks over, there is more of a small town Alaska flavor. From Skagway, I changed my ferry reservation to go out in the afternoon. Left about 1pm and arrived about 7pm. 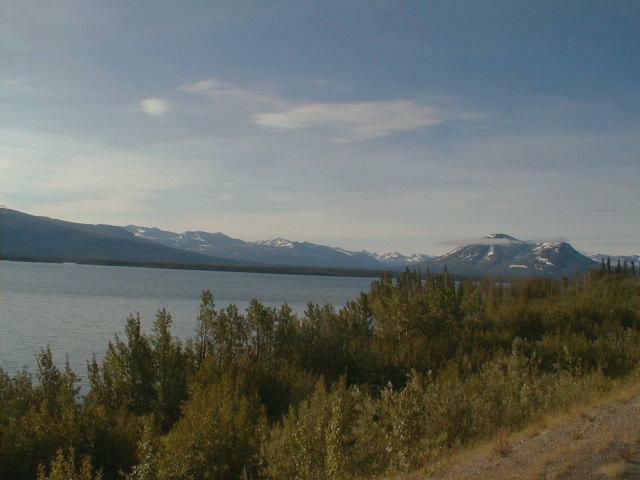 This time the Kennicott ferry. A few whales, but not as many as before. Overnight in Juneau, before catching an early flight back to San Jose. At San Jose reassembled my bicycle and pedaled home. Overall, a fun trip that is easily doable in a week. Beautiful scenery in crossing the mountains and interesting history along the way.